Most EDEN delegates are familiar with Land Grant colleges (program instituted in 1862), but not everyone may be familiar with Sea Grant colleges. The Sea Grant program was instituted in 1966 when Congress passed the National Sea Grant College Program Act. The program is administered by the National Oceanic and Atmospheric Administration (NOAA) and is based in Silver Spring, Maryland. The nation-wide network is composed of 32 university-based programs that work with coastal communities.Sea Grant extension is represented in every coastal and Great Lakes state and in America Samoa and Puerto Rico. Sea Grant Extension operates in much the same way as does Cooperative Extension–by taking the knowledge to the communities. Although not every Sea Grant college is represented in EDEN, we do have Sea Grant member institutions and delegates. Among those delegates are Bob Bacon (South Carolina Sea Grant Consortium and formerly served on the EDEN Executive Committee ) and Jack Thigpen (North Carolina Sea Grant). Jack currently represents Sea Grant on the Executive Committee. Michael Liffmann, Sea Grant Program Director for Extension and EDEN delegate, hosted several of us last week in Silver Spring. During our two-day meeting, we agreed that disaster-resilient communities is one theme common to both Cooperative Extension and Sea Grant Extension, and to focus on implementing a project developed by Mississippi-Alabama Sea Grant Consortium. The Coastal Resilience Index: A Community Self-Assessment was recently released and the first facilitator traning will take place February 22-23, 2011 in Biloxi, MS. The training is available to Sea Grant agents and Extension agents. More information about the Silver Spring meeting and outcomes will follow. Attending the meeting: (back row, left to right) Mike Liffmann, David Bryant, Abby Lillpop, Rick Atterberry, Jack Thigpen. 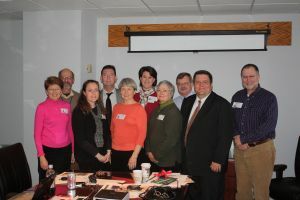 (front row, left to right) Virginia Morgan, Jody Thompson, Pat Skinner, Deborah Tootle, Bill Hoffman.